Syria's Regime And Rebel Group Agree To Truce That Will Begin Saturday : The Two-Way Despite its potential landmark status, the "cessation of hostilities" agreement is being met with skepticism, in part because it doesn't include two powerful jihadist groups. Syria's regime and opposition groups have agreed on a "cessation of hostilities." 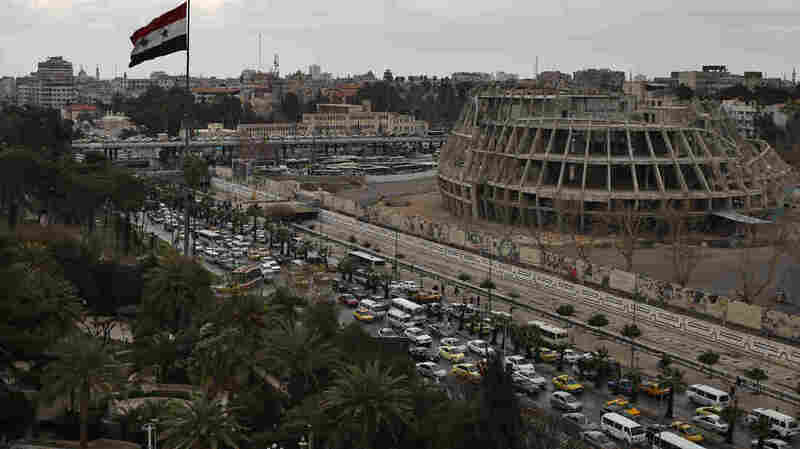 Here, a Syrian flag waves as vehicles move during rush hour in Damascus on Sunday. It wouldn't end all the violence that's torn at Syria for years now, but two key parties — President Bashar Assad's government and a main opposition group — have agreed to a truce, according to a joint statement by the U.S. and Russia. Despite its potential landmark status, the "cessation of hostilities" agreement is being met with skepticism, in part because it doesn't include two powerful jihadist groups, ISIS (known as Daesh in Syria) and Jabhat al-Nusra, and also because Assad recently said he reserves the right "to attack factions he calls terrorists," as NPR's Parallels blog has noted. The truce is set to begin at midnight Saturday (Damascus time); it was arranged by the U.N.-sponsored International Syria Support Group, which is co-chaired by the U.S. and Russia. "Consistent with UN Security Council Resolution 2254 and the statements of the ISSG, the cessation of hostilities does not apply to "Daesh", "Jabhat al-Nusra", or other terrorist organizations designated by the UN Security Council." "Syria says its forces will continue to target terrorist groups and their affiliates, in line with the truce's terms. At the moment they're trying to regain a key highway from ISIS that connects Aleppo to the rest of the country. "Syrian rebel representatives say they believe the regime will continue targeting the moderate opposition and civilians under the pretext of fighting terrorist groups." On Monday, Assad issued a decree that set a date for Syria to hold parliamentary elections: April 13. As the official Syrian Arab News Agency reports, his decree also includes the number of seats allocated for each voting district.